One of my favorite posts last year was about My Money Resolutions. It is just nice that I was able to write down once and for all the things that I want to resolve in terms of how I manage my money. As always writing things have a lot of benefit and I am happy to announce that almost all of my money resolutions were settled. I found the solutions through the right tool and proper mind set that I want to share to you. 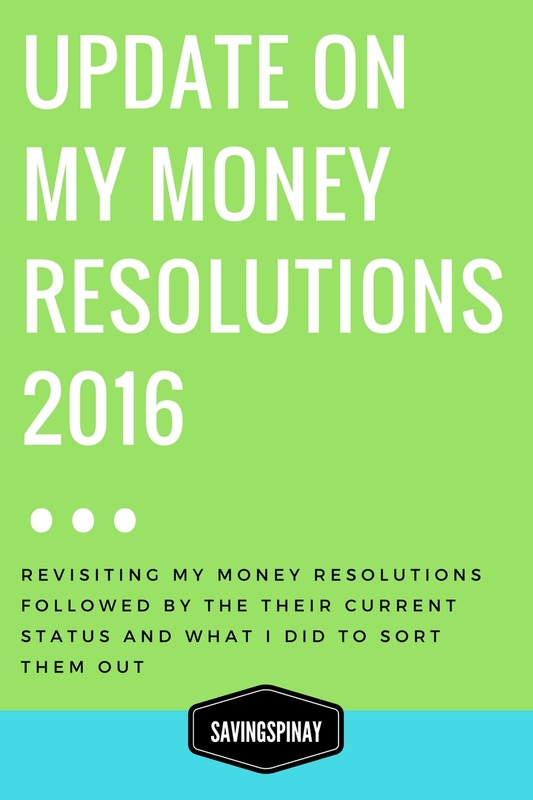 Thus, today we will be revisiting My Money Resolutions followed by the their current status and what I did to sort them out. Last October I finally found a simple way to track my spending. I admit that I wasn’t that consistent but still I had a record of my expenses for the whole -ber month. This gave me a better perspective on how I spend my money and whether I am wise enough on what I buy. I currently use a new spending tracker and if you want to learn about it simply click HERE. Find a system that works for you. If an app or digital tracking is better for you then do it, if not then stick to a notebook. Make it part of your habit. It will be daunting at first but when you’ll definitely get used to it. Make a review at the end of the week to reflect on how well you have spent your money. Well, I didn’t do this last year but this year I am definitely so into this saving method. Instead all my coins I decided to pick a denomination that I can save whenever I have it. It’s hard to explain but what I do is save every 10peso coin that I have at the of the day. Since I am already doing the 52 Week Money Challenge I decided that this Piggy Bank saving method could start on a low amount and 10pesos will do. Hopefully it’ll be a success. Hooray for being such a martyr when it comes to budgeting. Even if it doesn’t love me back I still continue to create a budget and pray I’ll commit to it every month, every week and every day. You can again read the post on My New Budget and Spending Tracker Notebook for more information. Also I encourage you to read my Financial Planning 101 Series for it will give a better view on how to create a solid financial plan this 2016. I did have some extra income last year that I’ll be forever thankful for. This year I wanted to save more and open more income streams. My saving goals post will be published hopefully next week so you’ll have idea on what I am saving up for but anyway the only solution I have with this is frankly, if you want to save more you need to earn more. And if you want to earn more you have to use your talent, your skills and your time wisely. My goal to earn extra income through freelance writing was a success last year and so I am continuing everything this year. I currently work for two clients which is insane because I never thought freelance writing will be this fun. I am also working hard to open my hosting services again probably March since my current month is full already so I’ll have more means of income. There’s nothing much more important that have a strong and consistent devotion with Christ. His grace will surely balance whatever difficult situation you are in. Keep Him part of your schedule, your day, your week, your month and you every decision in life. You have to be good in managing your time if you truly want to have a work-life balance. Set a specific time that you will get a particular stuff done. Read all of my Productivity Posts here. I don’t let work get into my personal and family time. As much as possible I make it sure that work stays at work. I make an effort to separate work time with personal time. I didn’t have that much reward given to myself last year but this year it will all about seizing the moment. The greatest reward I’ll be giving myself is TRAVELING and so I’ve been putting a lot of effort to save on my travel fund. Hopefully all the hard work will pay off with the memories and fun and relaxation traveling will bring into my life. I also did create a Things I Want to Have in 2016 list which is in my bullet journal that includes a pricier items I want to buy as a gift for myself. What are your Money Resolutions this 2016?